Every year, Rob asks me for a few ideas of what to get me for Christmas, and I think of a few things that I would like and use, that I haven't gotten around to getting for myself. I've been wanting an apron for a while, to protect my clothes while cooking and baking which I am doing more of now that Rob and I live together. I didn't want just any apron though, I wanted something cute and "girly", that I would enjoy wearing and look cute in! 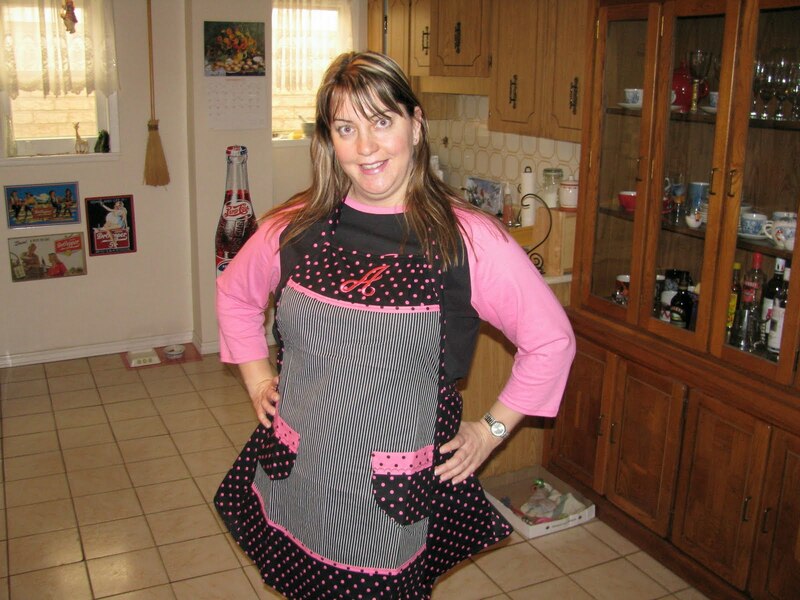 I "Googled" aprons and found a lovely site, "Aprons by Julie". What a find! This was EXACTLY what I was looking for! I was so excited about finding these treasures I couldn't wait til Christmas and ordered one right away which arrived on Monday. I love it! It's well made, I picked the design and colour, and she even embroidered my initial on the bib. I'm already thinking of ordering another one for myself! It is a cute apron! Can't spell my own name in the morning!! LOL! !